I was all set to give my opinions on Garrisons and then Preach releases a video that pretty much covers everything i was thinking and then some. It’s a good watch if you are so inclined. It may be a bit long for some but i feel he covers all of the aspects while trying to give solutions to what i consider problems. Boy are there ever problems. Garrisons, in their current form, are terrible. The initial design goal of WoD, as far as i understood it, was to get players out into the game world and away from cities. This is why i feel they removed flying and it’s something i completely agreed with at the time. It’s much more fun seeing players out and about on the ground instead of bypassing all interaction by flying over them. What garrisons did was essentially negate this entire design philosophy is one fell swoop. I can’t possibly fathom a developer making this decision without understanding the ramifications. I have to think this was a purely business decision instead of a gameplay one. The suits making the call over the devs themselves if you will. Convenience, as Preach states in his video, is the main problem. I completely agree with him when he says inconvenience is sometimes a good thing. It certainly is a good thing if it gets players out and about with regularity. This is the aspect i feel old school MMO’s understood and championed. Now don’t get me wrong, a lot of the older MMO’s went completely overboard with some annoyances, but overall they understood that interdependence is a good thing when you’re playing with others. You should want to see and interact with players. I have no reason or need to ever leave my garrison other than to raid or pick up bonus rolls. Hell, my bunker provides me with one of those options already anyways. Profession buildings, mines, gardens, banks, transmogers, and hell even auction houses are available to players without the need to ever go outside. Is it any wonder so many players don’t? Just log in for a moment and i guarantee almost everyone in your guild is in their garrison right now. That’s a huge problem in my eyes. No pun intended there but you get the picture. For them to be saved and to bring back some fun, the entire design of garrisons needs to change to what they should have been in the first place. Instead of a facebook mini-game, they should have been completely cosmetic and customizable personal housing. Think EQ2 or Wildstar with a Blizzard twist. Non-instanced Star Wars Galaxies type housing is never going to happen so i left that option out. This would allow garrisons to carry over into future expansions instead of being completely scrapped, if the rumors of that are true. I certainly wouldn’t miss them in the current form. Removing the convenience options within the garrisons would get players out into cities. While this may seem counterintuitive to the original goal, it’s better than the current mess we have. At the least, we’d see more players around and that sometimes goes a long way into encouraging socializing and interaction. The crafters and gatherers can have their fun again if anything and the transmogers and bankers can be lively once again. Speaking of crafters – personal housing would open up a whole new market for them as well. If we go by the EQ2 standard and expand on it, we’d see thousands of new items ranging from building materials to furniture and decorations. The gatherers feeding the crafters feeding the consumer. It’s almost as if this sort of system makes sense or something…Who’d a thunk it?! Certainly not Blizzard that’s for sure. Not only does this open up a whole new commerce but it can be a social aspect as well. We have entire web sites and blogs dedicated to transmogs. Could you imagine how many sites would pop up for personal housing? It would be absolutely tremendous in my opinion. 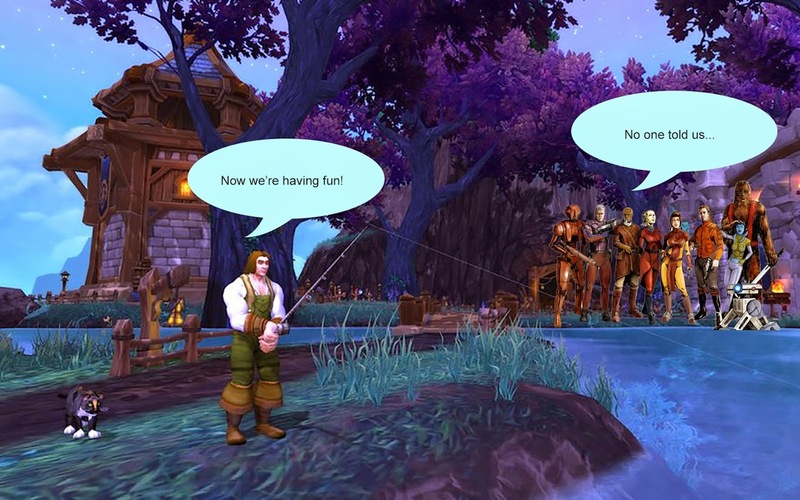 The ability to make garrisons public so that players can show them off and rate them would add another layer to the social aspect that’s entirely missing right now. EQ2 has an amazing rating system and leaderboard for personal housing which i love to use. Make it so Blizzard. For this system to exists, we need the ability to customize and build what we want within our garrisons. This would bring a much more personal touch to a system that’s completely cookie cutter and stale. Why can’t i build my own walls? Why can’t i place what i want where i want? Why can’t i decorate how i so choose? Why can’t i have statues or trophy pieces showing off my adventures? Why can’t i have dummies to display my armor sets? Why can’t i display my mounts? Don’t give me excuses that it can’t be done when some MMMO’s have been doing it for over a decade. If any company has the funds and manpower to do something like this, it sure as hell is this one. Now comes the decision of where to place the garrisons. My initial thought was to go the obvious route and place them in both Orgrimmar and Stormwind. Preach has a much better idea of placing them in the racial starter cities. I think this is a much more elegant solution and one that would open up so many more design options aesthetically. This also introduces something that I’ve always loved from older MMO’s; the mixing of high level and low level players in starter areas. There was nothing more exciting than seeing a high level player decked out in awesome gear as a lowbie. Perhaps this feeling has lost some of its meaning after all these years but i still enjoy it and i think many would as well. It’s certainly much better than placing them in the middle of nowhere. The current follower system is also not very fun or very rewarding. Well it’s rewarding in the sense of loot but unrewarding in the sense of accomplishment. I had hoped The Old Republic showed Blizzard that automating certain aspects of gameplay and passing them off to followers/companions is not a good model. It’s yet another example of removing interaction while turning tasks into a mini-game. This is not fun in the slightest to me. A much better system would have been to keep the old scenario concept and update them for Draenor. Give us missions that we can take 2-4 of our followers along with us and turn them into mini-raids. That essentially removes the automation and would have been absolutely amazing! Sending out followers passively on pointless missions every few hours is about as lazy a system as could have been implemented. Having to rely on percentages and sometimes luck on certain raid missions can be rage inducing. I love failing 97% missions through no fault of my own other than an arbitrary number next to my bar. The bodyguard trait was a good starting point for this and needs to be expanded upon. Allowing us to transmog our followers would have been another amazing addition. As someone who spends a lot of time making myself look good, i would have enjoyed carrying this over to all the buggers crashing at my pad. A little personal touch would go a long way into making me care about these drones. Yet another missed opportunity in my eyes. Who knows, maybe the current garrison iteration is a stepping stone to something much greater down the line. Maybe this was just a live test to gauge player interest and interaction. Hopefully they don’t see the overall system as a failure, as the implementation is the real culprit. I think there’s real interest in player housing moving forward but it has to be done right. It has to be much better than what we currently have but i’m not holding my breath. I’d like to say that it would be impossible to make them any worse but devs always amaze me. I can only hope.